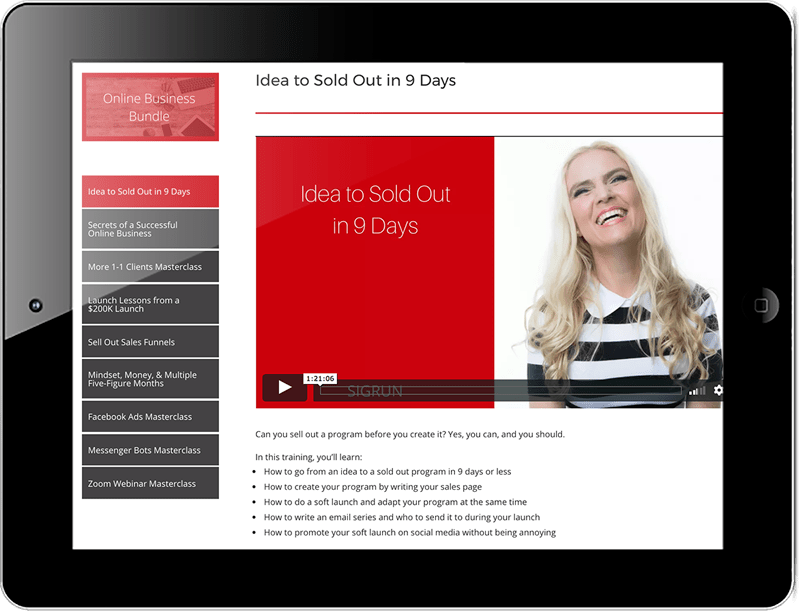 Get the exclusive Online Business Bundle! You'll have access to 9 valuable trainings only available to my SOMBA and Mastermind members. These videos will give you inspiration and action steps to get started on your online business today. A $497 Value for Only $197! The Online Business Bundle provides you with training on how to build the foundation of your income, how to grow with online programs and how to use the key tools of the online business world. This offer is only available to 7 Stages customers! Don't miss out! Build the foundation of your business. In this training you’ll learn how to create your program by writing your sales page, how to do a soft launch and adapt your program at the same time, how to write an email series and who to send it to during your launch and how to promote your soft launch on social media. In this training you’ll learn about the building blocks of an online business, what you should start with and what you can do later. This video will help you build a business from scratch with just your laptop. In this 1-hour masterclass I explain how to attract more 1-1 coaching clients and share several strategies on how get people to sign up with you and want to keep working with you. 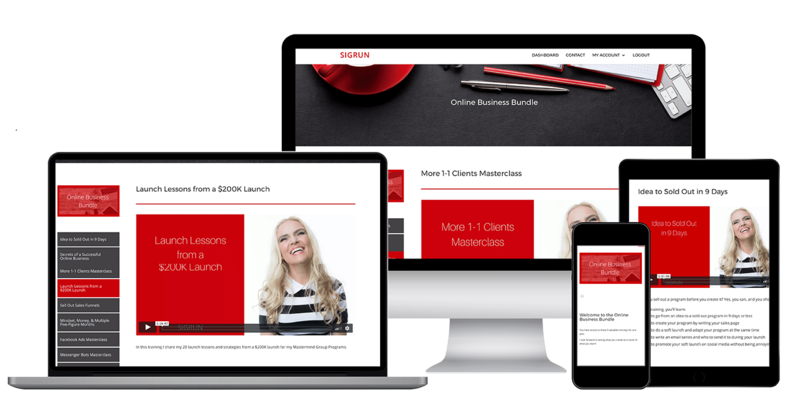 This Masterclass has yielded amazing results with SOMBA and Mastermind members! In this training I share my 20 launch lessons and strategies from a $200K launch for my Mastermind Group Programs. This is one of my most popular trainings - my clients love it! In this training, I create a sales map and take you through the strategy of building a sales funnel. In this training I explain how I went from earning $180 in one month to earning $53K in November, 2016. I tell you exactly what I did and how I’ve been able to uplevel my mindset in terms of money. There are key tools to build your business. 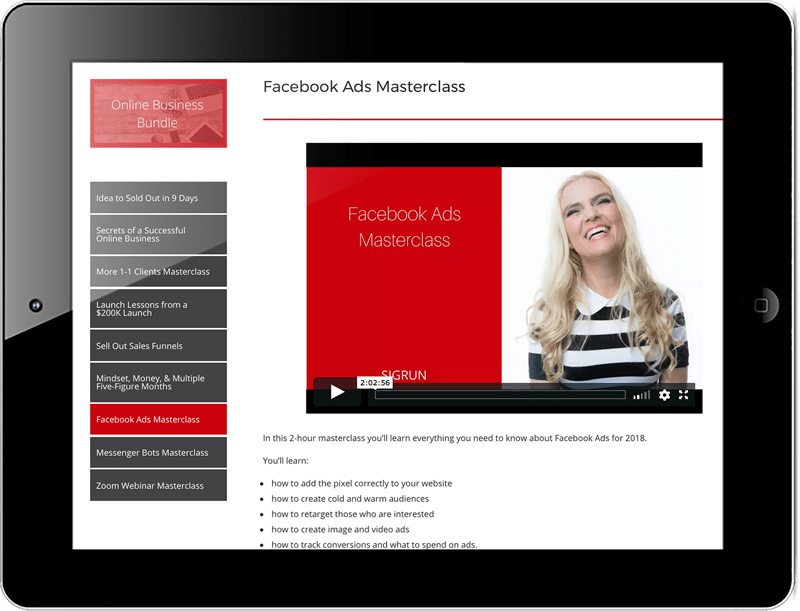 This is a comprehensive 2-hour training where you'll learn everything you need to know about Facebook ads in 2018. 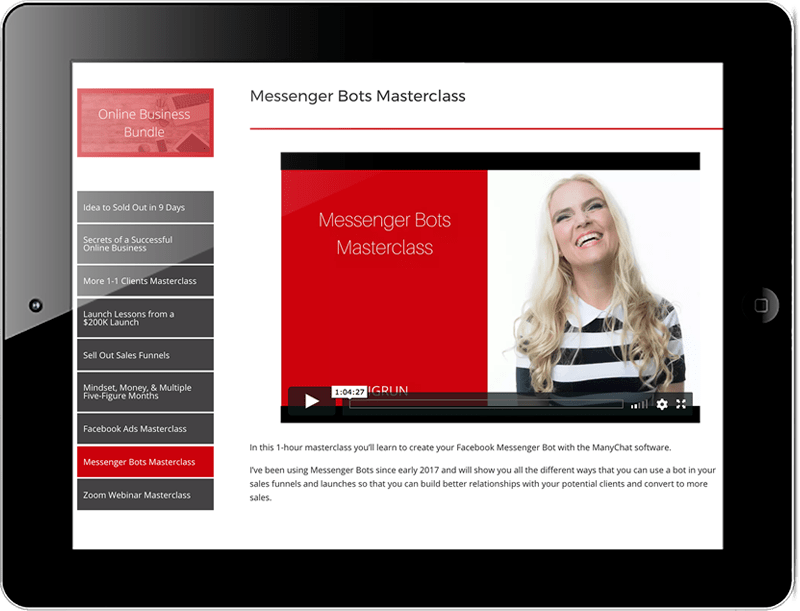 You’ll learn to create your Facebook Messenger Bot with the ManyChat software. I show you all the ways that you can use a bot in your sales funnels and launches to build better relationships with your potential clients and convert to more sales. 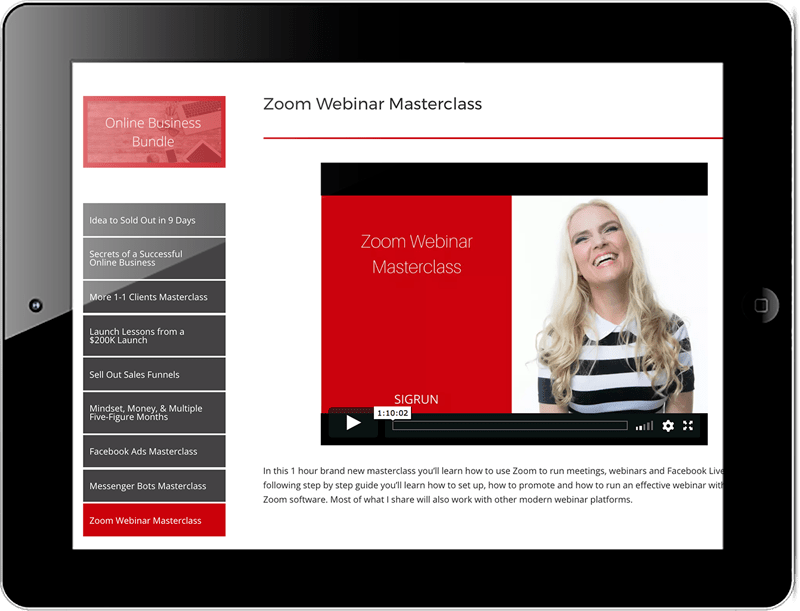 You’ll learn how to use Zoom to run meetings, webinars and Facebook Live. By following the step-by-step guide you’ll learn how to set up, promote and run an effective webinar with Zoom. Most of what I share will also work with other modern webinar platforms. Hundreds of my clients have seen incredible returns with only 1 of the trainings offered in this bundle. If you're an action-taker, these trainings will do the same for you!